ISLAMABAD, Oct 28 (APP): The 75th plenary meeting of International Cotton Advisory Committee (ICAC) would be held here from October 30 to November 4 in order to seek international best practices to overcome the issues and challenges faced by the cotton sector across the world. 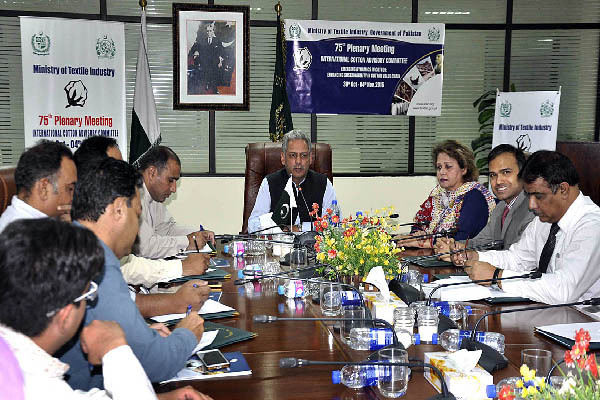 Addressing a press conference here on Friday, Secretary Ministry of Textile Industry, Hassan Iqbal said that bout 130 international delegates from 30 countries are participating the meeting. He said the title of the current annual general meeting is “emerging dynamics in cotton, enhancing sustainability in cotton value chain”. Secretary General of ICAC has arrived here to participate the meeting and share their experience with other stakeholders in order to promote and develop the cotton sector of the world, he added. He said main objective of the 5-day long meeting is to discuss the issues and challenges being faced by the cotton sector and find out their remedial measures in order to produce clean cotton for consumption. The other objective of the event is to showcase the local textile products and promote the textile industry in international markets to enhance local textile sector exports, he added. He said the event would also help in promoting the soft image of Pakistan as about 425 people from international and local cotton market, textile industry, researchers, scientists, businessmen and growers are participating the event, he added. Hassan Iqbal said the international scientists and cotton researchers would develop synergies to address the different issues and challenges which was reducing the crop output across the world. Replaying to a question, he said local cotton output was estimated at about 11 million bales against the domestic requirements of 14 million bales. The government was taking appropriate measures to bridge the gap of demand and production gap particularly producing the long staple cotton and started several programmes including growers training and introducing the innovative cultivation methodology, he remarked. He said government was also devising policy to promote and enhance the textile exports which was on the declining trend by introducing the technological advancement. Secretary textile said a field visit has also arranged for the visiting the delegates and industrialists for introducing them about the local textile industry. Besides, he said during the event stall would also be established during the meeting in which local ginners, industrialists and growers would showcase their products for the delegates. It is worth mentioning here the ICAC was established in 1938 and Pakistan become its member in 1948 and previously ICAC meeting was held here in 1951.